We should have featured Sheikh Hasina on these pages earlier, before despots, tyrants, shamed gurus, and other wannabe nobodies who became somebodies. But it’s always nice to look at issues and personalities in hindsight, as is my wont. 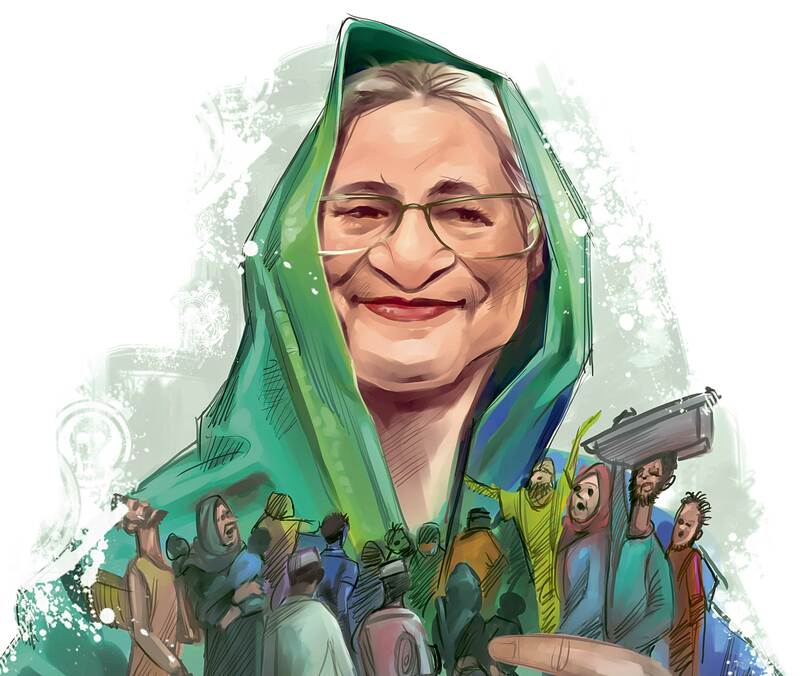 Let me also confess here that my original idea for this week’s column revolved around a South Indian actor and his opportunistic pitch at political stardom, but I shifted gears when I realised the Bangladeshi Prime Minister was the new star of the East. Expressions has no better hero than her this week — for her compassion and empathy in opening the border to save thousands of fleeing Rohingya.Yes, we missed this noble trait as the media was distracted by a Nobel peace laureate’s fading charm in Myanmar. I too bear the burden of guilt for ignoring Hasina’s humane approach to an unfolding catastrophe though I intently listened to her speak last week during the UN General Assembly summit. “It broke my heart,” she said. With leaders like the Bangladeshi PM at the helm, there remains hope in a world that is suffering from migration fatigue. Her actions seemed faint at first, but when Khaleej Times sent a reporter to the centre of the crisis on Bangladesh’s border with Myanmar where thousands of hungry people scrounge for a meal, live in ramshackle dwellings amid the dirt, grime and filth, the gravity of the problem came to light. It hit us hard and it hurt. I realise journalism is a collaborative effort, where ideas, people and their feelings come together for the right Expressions — and a universal cause. It’s okay to disrupt some ideas for a creative and emotional process that rattles and shakes you out of your comfort zone. World media are guilty of reporting the exodus through the eyes of Suu Kyi, who appears helpless to save the Rohingya after they were driven out by the Myanmar army from Rakhine, a state in the country. Many do not realise that the junta still wields real power in the country though her party, the National Front for Democracy, won the polls two years ago. For Suu Kyi, it is about surviving her electoral gains — or should I say spoils of the ballot — than preventing a mass of people from being thrown out of the country. She is a refugee of her personal political struggle that has not found its social and human voice. She’s entrenched and struggling to break free from the trappings of power and the paraphernalia of being First Counsellor, as her military resorts to ethnic cleansing. Indeed, she has dug herself into a hole and has become a symbolic leader who is devoid of emotion when talking of human suffering — she looked pale, a shade of her former activist self when she defended the purge. I have scant sympathy for the so-called icon as her voice failed her when she needed it most. If democracy is for the chosen majority, it becomes flawed and dangerous. And it’s easier striking deals with juntas and despots. Suu Kyi’s cultivated silence here has been deafening. I said so in one of our Editorials. I will say it again — I dislike the sound of silence when one should shout out for humanity. Suu Kyi may have lost her voice but it’s a great relief that Sheikh Hasina has found hers. Both Suu Kyi and Hasina are daughters of freedom fighters. They have witnessed tragedy at close quarters and remain true dynasts — South Asia has a thing for family politics. The difference though, is stark. One chose to be a spectator while the other displayed gentle mercy when lives were literally on the line. Hasina’s small country of 163 million took in 430,000 Rohingya in one go. Two weeks to be precise. The flow has trickled according to the latest reports. I’m reminded of an interview she gave during her visit to New York for the UN summit. “We already have 300,000 refugees but we have a large heart to take more, despite the difficulties of space.” It was not just an act of compassion, it showed courage during tragic circumstances. German Chancellor Angela Merkel was brave to allow 1.2 million refugees from war-torn countries, but Bangladesh is different, its resources are limited. This was an influx not of its making but the PM did not walk away from her human side. The total number of these migrants has crossed 800,000. Hasina has put forward a five-point plan to solve the issue that has religious, economic and social undertones. What makes her special is that she’s not asking for funds from the developed world. She wants us to show our collective mercy, our concern, and our commitment through deeds. If Bangladesh with its myriad issues, (it’s growing at 7 per cent) can do it, what’s stopping the richer countries from stepping out of their comfort zones?